I purchased these popsicles thinking that they were essentially the same as my homemade popsicles only to look at the ingredients list when I got home. No, I can't spend ALL DAY in the supermarket reading labels. I am super busy! The front of the box says "Made With Super Fruits" referring to Acai and Blueberry in the popsicle. I interpreted that statement to mean that there was no added sugar in these popsicles. Since these are FRUIT bars and not just "sugar water" popsicles such as other brands, I assumed that they were made solely with fruit - like the ones I make at home. and I paid about 50% more for this product than the store brand that just looked like colored, sugared water. You see, you don't actually have to add anything to apple juice to make a great frozen treat. It just works. Ummm, the second ingredient above is SUGAR. That means that the fruit ingredients are not contributing their natural sugar to the product as much as just plain old sugar. These are really SUGAR BARS with added fruit. I guess that "Sugar Bars with added fruit" doesn't move many products off the shelves so the marketers here just played on our busy lifestyles and fed us this lie so that we would buy them. Yes, I am calling the product name "Fruit Bars" a lie. Just because it has a little fruit in it does not make it a Fruit Bar! And, then, of course there is also "corn syrup" added to this product. So, sugar and the fruit concentrates weren't enough to make these sweet - they had to add corn syrup as well. The entire package sings the word "healthy" and I was completely fooled by it. I'm supposed to be the expert. sheeesh. 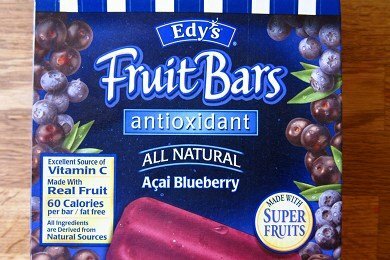 Please share your thoughts on Edy's Fruit Bars. I used to eat the lime version of these all the time before I was diagnosed with Type II Diabetes. Delicious, but not healthy. 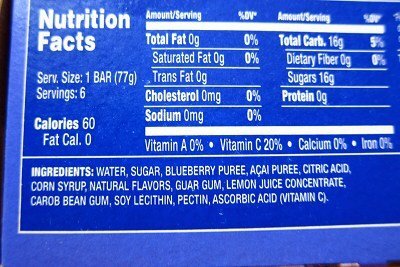 Since ingredients are listed in order of amount, you are dead on calling them sugar bars with added fruit! Why, oh why, do companies feel it is necessary to add sugar to fruit items. This makes me crazy - especially regarding applesauce. I picked up a name brand applesauce that was flavored because it said no added sugar. Yeah, but they added Spenda - to applesauce! Really? Argh. Sorry, veered off into rantville, but the whole 'sugar up the fruit' campaign makes me crazy. Colour me digusted. Glad I didn't waste any money on Edy's this week! I have seen these Edy's bars before, and considered buying them because they have a coconut flavor that looked pretty good. Fortunately I read the label at the store and avoided buying them. I don't know of any healthy no-sugar added popsicles you can buy at the store. Not even organic ones. I just make my own. I never add sugar to fruit products because fruit is so sweet already! I've fallen for that, too. So frustrating! What's the basic recipe to make your own frozen fruit bars? Also, if I wanted to add yogurt to them is there a way to do that and freeze them? (I've had a lot of trouble freezing yogurt. I think I'm not doing it correctly.) Any advice would be appreciated on this. It is very timely for summer! Sugar and corn syrup. Just what I want in my fruit bar--not. Yuck! I don't know I like the Edy's Strawberry fruit bars. Ingredients start as water, strawberries, then sugar... etc. No corn syrup in these. They aren't great to have everyday, but once in a while, I think they're not bad. Better than HFCS stick ones. I found Yasso greek yogurt pops at BJ's wholesale store. They have a lot of protein and a little sugar. I feel like they are a pretty healthy treat. It is tricky to find convenient.foods that are truly healthy. Great post. I hate when that happens. i am pretty savvy about label reading but sometimes when we I am in a rush I just looking at the front of the box and then when i get home and look at the box i can not believe it. Home-ade is almost always better and unfortunately food manufactures do not seem to care about what is in their product. awareness and being a smart shopper is so important. I'm glad to see you calling them out on their misleading product. The marketing that companies do to sell their products...it is disgusting. I make my own frozen pops using plain yogurt and juice. Oh, man! You know I never even looked at the ingredients. I just took their word for it when I read the front of the box. Thanks for clarifying! I like sugar. But I'd rather get my sugar in REAL ice cream occasionally, or in chocolate (yum). The only "fruit" bars that should be adding a lot of sugar that I'd expect it in, would be the naturally SOUR fruits like lime and lemon. PS if I want a sugar popsicle with some fruit in it, the Mexicans do it VERY well and cheaper and don't advertise their confections as "healthy." I don't know how hard that is to find in other parts of the country but in California, Arizona, southwest US it's easy to find those. I don't get it. Real blueberries, when picked at the peak of perfection are very sweet and delicious indeed. Why do they need to add sugar and/or hfcs to these bars???? I could see having sugar in an ice cream bar, obviously, but when a person chooses to buy a fruit bar, there is usually a reason - he or she wants a healthier option. Sigh.